Winner of the ‘Practical Manager’ category at the CMI Management Book of the Year Awards 2015 and now fully revised, updated and with 31 new theories. 101 management theories from the world’s best management thinkers – the fast, focussed and express route to success. As a busy manager, you need solutions to everyday work problems fast. 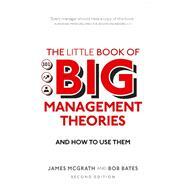 The Little Book of Big Management Theories gives you access to the very best theories and models that every manager should know and be able to use. Cutting through the waffle and hype to focus only on the ones that really matter to managers day-to-day, each theory is covered in two pages – what it is, how to use it and the questions you should be asking – so you can immediately apply your new knowledge in the real world. · Discover clear insights into a wide range of practical management issues and how to deal with them. All you need to know and how to apply it – in a nutshell. Winner of the ‘Practical Manager’ category at the Chartered Management Institute Management Book of the Year Awards. James McGrath worked as an accountant and senior manager in industry, local government and as a self-employed management consultant before becoming Course Director for the MA in Education and Professional Development at the City of Birmingham University. He is also co-author of The Little Book of Big Management Theories and author of The Little Book of Big Management Questions and The Little Book of Big Decision Models.